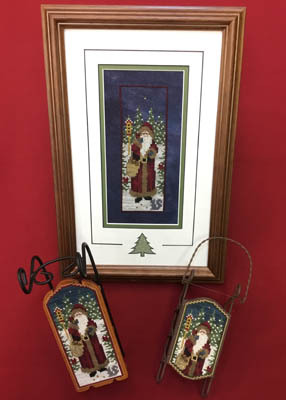 Morning Star Santa from Foxwood Crossings is shown as a picture, on a small sled and a large sled. The picture has a stitch count of 31w x 84h and is shown stitched on 14/28 count Gothic hand-dyed fabric from Picture This Plus. The sleds are stitched on Antique Brown perforated paper. 6 Weeks Dye Works, 1 Classic Colorworks and 2 Gentle Art hand-dyed fibers are used with DMC alternatives provided.